Tsingtao Racing /Hampshire MV Agusta has confirmed that eight time TT Race winner Ian Hutchinson will race their factory backed MV Agusta in the Monster Energy Supersport TT Races in 2015. The Bingley Bullet returned to the TT last year after missing the 2013 meeting through injury. The team will campaign the iconic Italian marque's F3 675 machine. It has a unique three cylinder engine with a counter rotating crankshaft - a ground breaking solution previously only seen on MotoGP bikes. MV Agusta is one of most widely revered manufacturers at the TT. MV Agustas have won 34 TT races and taken 61 podiums between 1952 and 1972.The first race win came in the 1952 Ultra-Lightweight race, won by Cecil Sandford, while the last was the 1972 Senior won by Giacomo Agostini. While Agostini is the most successful MV Agusta rider at the TT with 10 wins to his name, some of the greatest names in the event's history have also raced on MVs including John Surtees (6 wins), Carlo Ubbiali (5 wins), Mike Hailwood (4 wins) and Tarquinio Provini (3 wins). Other race winners have included Gary Hocking (2 wins) while John Hartle, Bill Lomas, Cecil Sandford and Les Graham have also stood on the top step. "MV Agustas are indelibly associated with the Isle of Man TT Races and we are looking forward to adding the next chapter in our long and successful history of racing on the Isle of Man. Ian Hutchinson is a legend around the Mountain Course and it is fitting that he is following in some of the great names that have raced MV's at the TT." "I'm really pleased with the signing of Hutchy for this year's IOM TT as well as the North-West 200. It gives us a great opportunity to challenge at the front and as we all know he is a TT winner." "MV Agusta has a winning tradition at the TT and we are going to do everything we can to do that. I know that Giovanni and all the staff at the Italian factory are supporting us and it means we can have a real shot at it." "The 2015 F3 is better than every and results in WSS have proven the bikes competitive so we now need to make that happen on the 36 ¾ mile circuit. 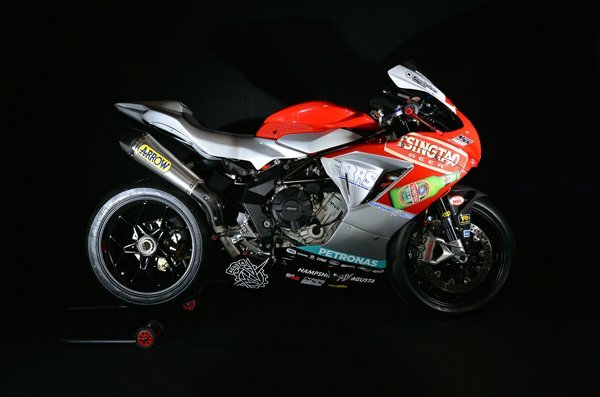 It is the third time we have been at the TT, in 2013 the team was the first to bring a Chinese bike and this year we hope to bring a trophy back to Hampshire MV Agusta."